Audrey from AudreyGardenLady and a fellow UWIBer sent all of us Adult Truths a couple of days ago! And where did she get them from - well, she got them from her dear father! I picked out 10 of my favorites to share with all of you!. 3. There is great need for a sarcasm font. 4. How the *^$# are you supposed to fold a fitted sheet? 6. You never know when it will strike, but there comes a moment at work when you know that you just aren't going to do anything productive for the rest of the day. 9. I love the sense of camaraderie when an entire line of cars team up to prevent a jerk from cutting in at the front. Stay strong, brothers and sisters! 10. Shirts get dirty. Underwear gets dirty. Pants? Pants never get dirty, and you can wear them forever. And here's a sneak peak at some of the wonderful items that Audrey creates.... be sure to visit her shop for more! Audrey's Father Rocks! AND so does Audrey's Jewelry...I want it all!!!! Enjoyed reading the adults truths. Laughed when I read many of them...so true! 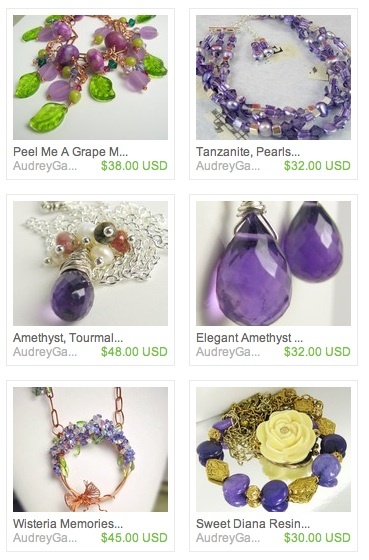 Very inspiring to see the beautiful jewelry that Audrey makes. Thank you so much for this great feature Rita! and to Karen and Ann for their kind comments! It's a Lazy Day Today!